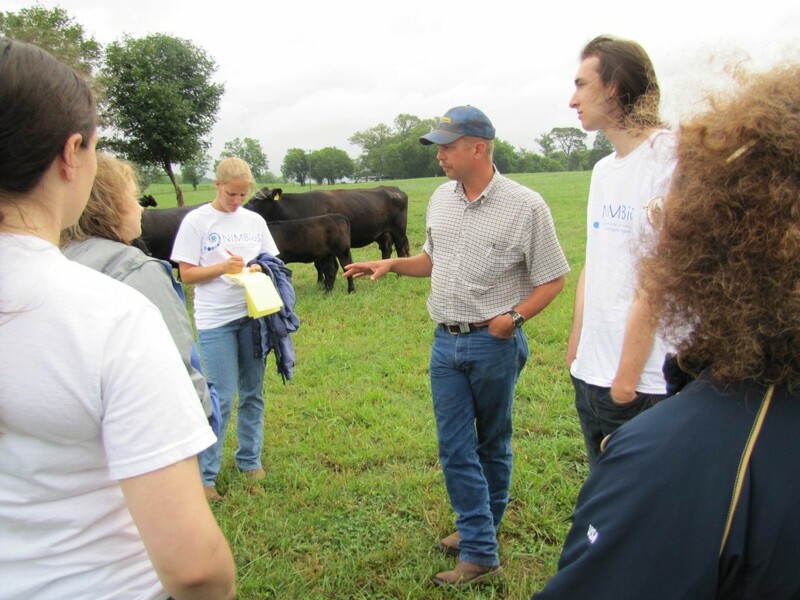 NIMBioS REU/REV students learn about cattle management methods from farm manager Brandon Beavers and the ways they might incorporate in the data into the mathematical models they are developing to help control the spread of e-coli. How a cattle herd is managed can affect how e-coli bacteria spreads, so students from NIMBioS’ REU/REV program visited a farm today to learn about cattle management methods. The group hopes to incorporate some of what they learned into the mathematical models they are developing to understand and control the transmission and spread of e-coli bacteria. Brandon Beavers, who manages the farm at the Blount Unit of UT’s East Tennessee Research & Education Center, talked to the group about management practices as they visited the barns and the cows in the pasture. The farm maintains a purebred Angus herd, which consists of about 150 mature cows. The “E-coli Research Team,” one of six REU/REV team projects at NIMBioS this summer, includes Daniel Brooke, a veterinary student from North Carolina State University; David Haycraft, an undergraduate from Howard University; Rachel Johnson, a veterinary student from the University of Tennessee (UT); and Shaniell Nelson, a science teacher from Campbell County High School. Also visiting the farm were the group’s research mentors, Suzanne Lenhart, NIMBioS associate director for education, outreach and diversity, and Cristina Lanzas, assistant professor of epidemiology in the department of comparative medicine in UT’s College of Veterinary Medicine. This entry was posted in Education/Outreach, REU/REV and tagged Education, REU/REV. Bookmark the permalink.